In our latest takeout commercial, our friend Ian again makes a mad dash through the city in search of Eat'n Park takeout to satisfy his craving for a fish sandwich. Whale of a Cod to the rescue! It’s true what they say about bunnies – they really know how to multiply! At Eat’n Park, our Bunny Smiley Cookies have hopped into town, and this year, they’re joined by our NEW Sarris Milk Chocolate Bunny Smileys. Talk about the perfect combination! These adorable treats make it easy to throw together an Easter basket that will suit anyone’s sweet tooth. Our chocolate Bunny Smileys are individually wrapped, and you can score a whole herd of them for just $1 each. And as always, you can pick up a dozen Bunny Smiley Cookies for only $6.99 in our restaurants. But filling Easter baskets isn’t the only way we can help complete your Easter celebration. Our fresh-baked pies are all available for order. Nothing says spring quite like a slice of Lemon Meringue – and you can get a whole pie for just $6.99 this month! We also have muffins, fresh breads, and more available for order from our bakery – just click here to take a look at our order form. Call your local Eat’n Park and put your order in today! 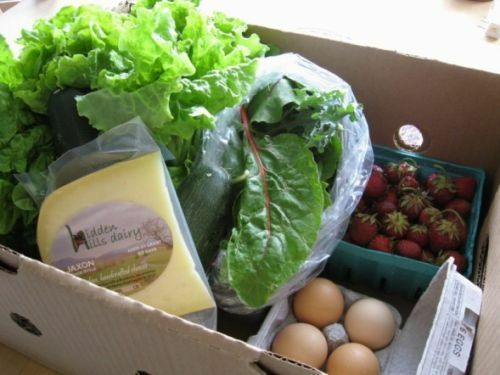 Finally, if you have loved ones who won’t be able to make it home for Easter this year, you can still send a sweet surprise from our online store, where we have Easter gifts starting at just $24.99. Our Bunny Smiley Cookies are paired with classic Easter treats like Peeps®, jelly beans, and those chocolate Bunny Smileys, all inside a wicker basket filled with shredded paper “grass”. When your gift lands on their doorstep, your loved ones will surely think that the Easter Bunny has made a special delivery! Click here to see what we have to offer. Lent begins this week, which means that Seafood Specials are here at Eat'n Park! We have some brand new items (just click here to see them all), in addition to classic favorites like our Nantucket Cod, Seafood Pasta Bake, and Baked Lemon Sole. Speaking of classic favorites....there's nothing more classic than our Endless Soup & Salad Bar. And it goes perfectly with any meal, including our new specials! Try it for yourself with the coupon below - take $2 off the Salad Bar when you add it to your meal. Just click here to print your coupon. Expires Sunday, March 20, 2011. Get Lucky with Shamrock Smiley Cookies at Eat'n Park! 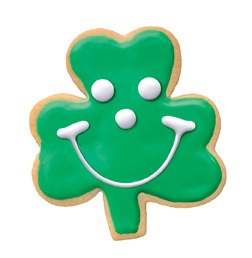 On St. Patrick’s Day, everyone is Irish…so share a little luck (and sweet green goodness) with Shamrock Smiley Cookies! These seasonal favorites are available in our restaurants and online store now, so get yours while you can. There are 4 towns in the U.S. named after a shamrock: Mount Gay-Shamrock, West Virginia; Shamrock, Texas; Shamrock Lakes, Indiana; and Shamrock, Oklahoma. Looking for more ways to get in the spirit? How about serving those Shamrock Smiley Cookies with a glass of green milk? Or, even better, a minty green St. Patty’s Day Shake at Eat’n Park! If you’ll be celebrating at home, get the kids together to help with this authentic Irish Soda Bread. It’s quick and easy – especially because you don’t need to wait for the dough to rise. The recipe was actually born out of necessity, since yeast won’t leaven the soft wheat grown in Ireland. Heat the oven to 350 degrees. In a bowl, combine the dry ingredients. Cut in the butter until it is pea-sized. Stir in the raisins and buttermilk or yogurt. Turn the dough onto a floured surface, knead 1 minute, and shape into a disk. Cut an "X" in the top and bake on a greased baking sheet for 45 to 50 minutes. Makes one 8-inch-wide loaf.